Incredibly this was my first experience with winter tyres in 5 decades of driving experience (I first drove a car in 1978 - true!) and I wasn't entirely convince that it wasn't all a scam, placebo effect, Emperor's new clothes, etc. Following some research I discovered that in certain Alpine countries winter tyres are mandatory, at least for locals and I have heard stories about how the fine Gendarmes of France love to fine Les Rosboeufs and how legal action is possible if an accident is deemed to be caused by failure to have the correct boots installed. My only benchmark was to compare the result of equipping Uncle Fester the tired old Fiesta with a pair of Cooper 155/70 x 13 winter tyres and see the difference compared to my "all seasons" tyres from Matador, an economy brand from premium tyre manufacturer Continental. Cheekily, I only fitted winter tyres to the front wheels (driven) wheels and I discovered this season (2012) that such is the difference in grip from these tyres, that the rear of the car will tend to slide out and oversteer quite readily, even in the wet! Driven gently, there was no noticeable slip driving on freshly snow covered roads. If provoked the driven wheels will spin, but even then they still shovel snow behind you and exert purchase on the snow. Likewise, if you brake too heavily and lock up wheels, they still provide friction, even when locked. Such was the difference in grip between the front and rear wheels on a snow covered car park in Switzerland, that it was possible to drive away with the rear wheels totally locked by the handbrake and drive the car around like a sled. 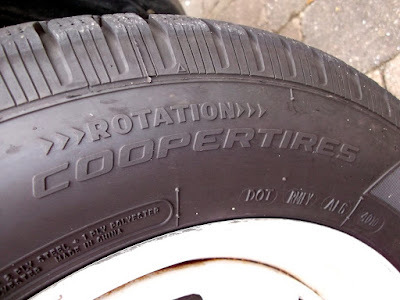 It is worth noting that these Cooper winter tyres have also worked exceptionally well in wet conditions too, at the time of writing (April 2012), the UK is experiencing a cold snap and I have delayed swapping back to my summer boots. Considering the tread pattern, road noise was no different on the motorway to my normal tyres and fuel economy remained the same. As Scotty would have said in the original Start Trek TV series "Ye cannae change the laws of physics! ", the excellent grip comes from a combination of the soft rubber compound and high void ratio, in anything but cold conditions wear will be faster than regular tyres. You have to fit winter tyres in November and remove them at the end of April. It is simplest if they live on a dedicated set of winter wheels and therefore need to be stored somewhere away somewhere dark during the summer months.